When I first saw the cover of this book I initially got very excited because I thought the story contained sword-fighting and martial arts. I didn’t stop long enough to take a closer look at what the girl clutched in her outstretched hand. I’d already read the story’s plot and was eager to start reading. What struck me wasn’t the fact that there were no martial arts or sword-fighting whatsoever, but author Esther Friesner’s sheer mastery of vivid, poetic imagery sewn together in a lattice of history, myth, and tradition. No stranger to story telling, she’s the author of thirty plus books in what she calls her Princesses of Myth series where all the stories are centered on historical heroines with a twist. So how is it I’ve never heard of Esther Friesner? Well, I’ll chalk it up to the fact that there are just too many books and too little time to get to each and every one. But oh, how happy I am to have found Friesner and her wonderful tales. I’m thrilled my own novel research led me to this gem. 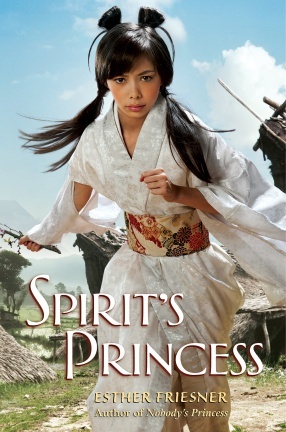 Written in first person, Spirit’s Princess tells the tale of Himiko, a Japanese chieftain’s daughter who is determined to find and follow her own path no matter the objections she has to overcome. This novel stirred up a whirlwind of emotions within me. I laughed, cried, got angry, and even a bit depressed. Though I’ve finished the book, I still mourn the loss of one character, and feel so badly for another especially since the news hasn’t reached him yet. I expect book 2, Spirit’s Chosen will reveal this unexpected news. Friesner’s use of metaphors is unlike any I’ve ever seen in other books. Her metaphors conjured up fantastical images that made the book more enjoyable. I found it quite charming that the author seems to have a fondness for puppies, as there are at least three metaphors spread throughout the book that mentions them. Her description of love at first sight was done in such a way as to make the reader feel it. A number of her major and minor characters like Himiko, Aki, Lady Yama, Kaya, and Ryu were so well rounded, I never felt one was any less important than the other. I’ve got a very fertile and vivid imagination and any book that fails to engage me this way, is one I’ll lose interest in fast. But this book did not disappoint. From the first page to the last, I was brought to the edge of my seat more than once, made to feel the same feelings of joy, sadness, or pain as the characters I rooted for. In the end, I feel as if I’m left dangling over a precarious precipice and the only way to save myself from falling is to get my hands on the sequel, Spirit’s Chosen, as fast as I can. For more information on The Princesses of Myth series, go to http://www.princessesofmyth.com. All other books by Esther Friesner can be found here. This entry was posted in Books and tagged FANTASY, heroine, Japan, mysticism, young adult. Bookmark the permalink.